Like many DIY dressmakers, a major factor motivating me to make my own clothing is an ethical conscience. I love clothes, yet the adverse impact that fast fashion can have on both our natural environment and the lives of the people working in the industry makes me feel deeply uncomfortable. The Bangladesh factory disaster, which killed 1,127 people who were making garments for the high street shops we know all too well, served as a nasty reminder of what can happen when cheap clothing is considered more important than the welfare of human beings. While my own spending habits are by no means perfect (I should really spend more on ethically-sourced fabric, for example), I do endeavour to take a mindful approach to consumption myself and to support work to encourage sustainable consumer habits more widely. Which is why I'm proud to be backing Craftivist Collective's latest project for War on Want's Love Fashion Hate Sweatshops campaign. 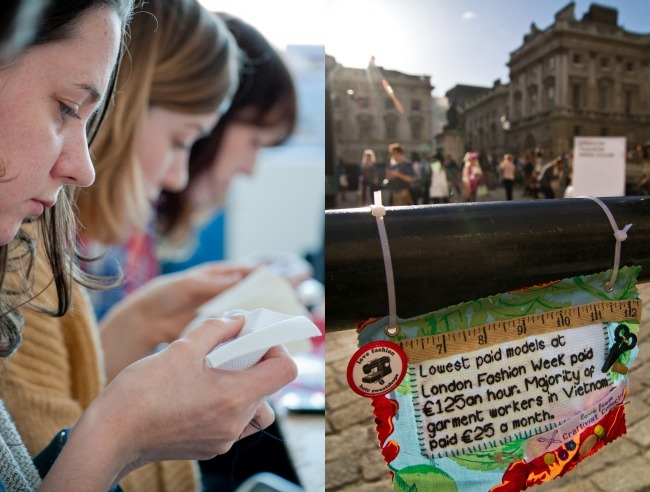 In advance of London Fashion Week, Craftivists are asking people to stitch mini protest banners with messages related to the exploitation of sweatshop workers. These banners can then be hung in public spaces, and photographed for a display at this Autumn's Knitting and Stitching Show. If you'd like to part of the project, take a look at their website for more details. For more on the Craftivist Collective, take a look at my interview with their founder and my report on what a great time I had at one of their stitching events. And big thanks to Sarah for featuring me as Miss August in their Craft Crush series.